drugs | What Did You Say? President Donald Trump delivered his first primetime Oval Office address on Tuesday night, where he explained how the situation on the porous southern border of the U.S. had reached a “crisis” level in terms of humanitarian and national security needs, a crisis which necessitates the construction of a border wall in some areas as part of increased border security overall. Democrats and the media immediately set about disputing Trump’s labeling of the border situation as a “crisis,” part of their overtly biased effort to instantly “fact-check” every word or statistic uttered by the president in the brief speech, and — coincidentally? — all seemed to arrive at the same conclusion: There is no real crisis at the border, only a “manufactured crisis” brought about purposefully by Trump’s actions, or some such nonsense like that. Of course, to follow along with the media’s bouncing ball on this one, everyone must ignore the fact that the same liberal media loudly trumpeted the “crisis” at the border in 2013 and 2014 — when they were supporting comprehensive immigration reform and amnesty for illegal immigrants — or their hollering about a “crisis” on the border through much of 2017 and 2018 when Trump began to crack down on illegal border crossings and deportations ticked up. In truth, however, the only thing “manufactured” about all of this is the Democrats ‘obstinate opposition to the president and their refusal to acknowledge the basic and undeniable facts of what is occurring on and around the porous and lightly defended southern border. Case in point, Reuters reported on Thursday that at least 20 dead bodies — 17 of which had been badly burned — were discovered on Wednesday in the Mexican city of Ciudad Miguel Aleman, which is located a mere 56 miles across the Rio Grande River from the U.S. border city of McAllen, Texas, where President Trump visited with U.S. Border Patrol agents and other officials on Thursday. Mexican authorities are reportedly investigating what has all the appearances of a deadly battle between members of two rival gangs in the area, gangs that routinely play in a role in the illicit cross-border excursions that bring illegal aliens, criminals, drugs, weapons and even terrorists into this nation. The suspected gang-related massacre even drew a mention from Mexican President Andres Manuel Lopez Obrador at his daily news conference on Thursday, and though he didn’t offer up much in the way of specifics, he did say that security officials would provide more information at a later date or time. 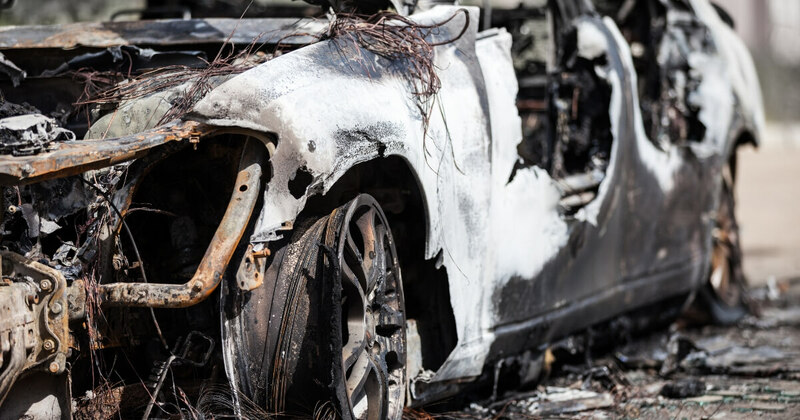 Reuters noted that according to one Mexican security official, five burned-out vehicles were also discovered along with the 20 dead bodies, though the outlet noted that a separate Mexican security official had reportedly counted as many as 21 dead bodies at the scene. The grisly scene was located in the Tamaulipas region of Mexico, one of the more violent states in that nation that has been controlled by dangerous criminal cartels and gangs for years. Those groups exert a great deal of control over drug and human trafficking across the border in that region, and are well-known for running extortion rackets on local residents and exploiting migrants passing through the area for whatever can be gained. When not engaged in those border-related crimes, the cartels and gangs are fighting violently among each other or waging war against Mexican security forces, violence that has claimed tens of thousands of lives — some innocent, some not so much — over the years. Obviously, incidents like this one — and this bloody incident is far from an isolated occurrence — are what President Trump is referencing when he speaks of the “crisis” at the border while demanding Congress appropriate the necessary funds to construct a border wall where needed and to increase border security measures in other ways. Yet, based solely on their reflexive opposition to all things Trump, many talking heads in the liberal media staunchly refuse to acknowledge as a “crisis” what their own colleagues are quietly reporting on a near-daily basis. Indeed, some in the media have even adopted a sort of “Don’t believe your lying eyes” attitude when it comes to their anti-Trump reporting on the border, as evidenced by a ridiculous tweet from CNN’s Jim Acosta that actually seemed to prove the president’s point about how necessary and effective a border wall truly is. In several other tweets after that, Acosta hyped up how safe the border town of McAllen is — while studiously ignoring the obvious fact that McAllen is safe because it has a border wall and other barriers obstructing those who would illicitly cross over. Unfortunately, the wall and other barriers along the border in the McAllen region that keep it so safe only extend for so long, and eventually give way to mere chain-link fencing or nothing at all, meaning those who wish to cross the border illegally need only walk around the end to do so. Anyone with common sense and intellectual honesty can plainly see that and realize Trump is absolutely correct to want to address this security crisis post haste. Writer and researcher. Constitutional conservatarian with a strong focus on protecting the Second and First Amendments. A misleading tweet from a reporter had Democrats and liberals on social media up in arms recently after it announced that a military veteran was being deported to Mexico. However, what the tweet left out was that the man had been drummed out of the military for a drug infraction, that he had served a lengthy prison term after giving drugs to an undercover officer — and that the deportation order had been issued under the Obama administration. It didn’t take the left long to pounce and take up the Chicago resident’s case. Heartbreaking, until you consider what Mr. Woodman left out. And, according to the Washington Free Beacon, that’s a great deal. First, Perez was given a general discharge from the Army on a drug infraction. In 2008, after his military service, according to the Chicago Tribune, he “handed a laptop case containing cocaine to an undercover officer” and ended up being sentenced to 15 years in jail. Perez, 39, was born in Mexico and came to the United States when his father moved the family to Chicago because of a job offer, according to CNN. He is currently on a hunger strike as he faces deportation. He says he mistakenly thought he became a U.S. citizen when he took an oath to defend the United States while in the military. He also contends his military superiors did not help him understand just what he needed to do in order to become a citizen. After he was released from prison in September 2016, he was placed into the custody of Immigration and Customs Enforcement and ordered deported. This, you may note, happened under the waning months of the Obama administration, which had every opportunity to make sure Perez stayed in the country. It did not. Perez has previously argued that veterans with combat experience are targeted by drug cartels in Mexico to work for them, although a three-judge panel on the 7th U.S. Circuit Court of Appeals rejected that argument in late January. While Perez may have served this country, the fact is that he is being deported for a reason: He is not an American citizen, and he committed a serious crime. Courts under both the Obama and Trump administrations have upheld his conviction, and if the Democrats had wanted to do anything about it, they certainly had a president who could have done just that. He chose not to, likely for good reason. To drop this on the Trump administration is the height of deceptiveness. If liberals want to look at who’s really responsible for deciding this, they ought to look at someone else from Chicago: former President Obama. Members of Mexican cartels are flocking to a new Mexican folk religion, and it puts a dark spin on Christianity. The religion involves devotion to La Santa Muerte, which translates to “Holy Death” or “Saint Death,” and can even include human sacrifice, reported Fox News. The popularity of the religion among drug traffickers and violent criminals in Central Texas has raised concern among authorities, prompting Texas officials and the Catholic Church to warn about the dangers of the dark creed. The report mentioned three instances where brutal killings took place in the name of Santa Muerte, killings that rival even the butchers of the Islamic State group. “We’re seeing more and more criminals that are praying to Santa Muerte,” Robert Almonte, a former El Paso narcotics detective and former U.S. marshal, told KVUE. Which is the reason why citizens, especially those in law enforcement, should be aware of this dark practice. Almonte conducts seminars to inform law enforcement officers about the signs of the Santa Muerte cult. “Officers are entering homes on drug search warrants and they’re encountering elaborate Santa Muerte shrines,” an undercover Austin police officer told KVUE. Almonte also said that those practicing the religion believe that more intense sacrifices will earn them favor with Santa Muerte. It’s frightening to think that people practice this kind of “religion,” and it’s even more frightening that we are seeing evidence of it in our own cities. A new kind of lollipop was discovered by police in the Houston area, and it’s one that you want to keep far away from any children you know. The treats are reportedly laced with methamphetamine. Police in Spring, Texas, responded to burglary call when they made the discovery. They found a man and a woman who had stashed so much of the drug candies in their car that the back hatch wouldn’t close, Lt. Ruben Diaz said at a news conference Tuesday, the Dallas News reported. The Harris County Sheriff’s Office said police estimated that the couple had around 600 pounds of the meth-pops in their car. Deputies believed the suspects, Evonne Mick, 36, and David Salinas, 21, took drugs from the house where the burglary had reportedly taken place. “None of the investigators with me had seen it done like this before,” Diaz said, according to KRIV, Fox 26 in Houston. “Bags and bags of what appear to be candy lollipops, but they all have meth inside them,” he said, adding that the pops were in a variety of shapes, including butterflies, flowers, bats and Star Wars characters. The lieutenant also said each lollipop had street value ranging from $20 to $40. Diaz added that it appeared that the lollipops were designed to target children. “If they were not sold directly to a child — if the lollipops were dropped anywhere in the neighborhood — a child picking them up would think it’s regular candy,” he said. Mick and Salinas face a charge of possession with intent to deliver a controlled substance. Diaz said authorities did not believe the couple actually made the lollipops, adding that the department was working on finding out who did make them. Drugs and candy are a bad combination. If you see a child with one of these lollipops, knock it out of their hand immediately.